Way back in September, I was with the OpenBCI folks at Maker Faire NYC showing off our very first OpenBCI prototype. I was there wearing my bright blue EEG cap doing live demos of my brain waves. It was fun. On day 2, however, there was a guy who came up and demanded (politely) that he wear the EEG cap. Given how long it takes to setup the cap correctly (with all the EEG gel and whatnot), I tried to decline his request. But he persisted. He told me that he was a meditator and that he needed to know if anything was actually happening in his brain when he was meditating. Wow, you got me hooked me. Let's do it! Non-Meditating: First, just so we all recognize what a normal, messy EEG recording looks like, check out the graphs below. 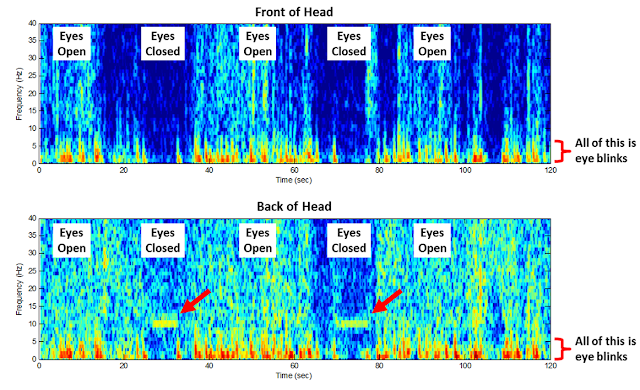 These are spectrograms of EEG signals recorded from my head using OpenBCI V1 and an EEG cap with tin electrodes. The top plot is from the front of my head (Fp1-Fz) and the bottom plot is from the back-left area of my head (I think that its actually T5-Fz). Note that both signals are highly corrupted by low-frequency artifacts from blinking my eyes. Otherwise note that, when my eyes are closed, I show a nice signal ~10 Hz in the back of my head. This is the classic posterior dominant rhythm that occurs in the Alpha band. Notice that, besides the alpha and besides the eye blink, there is not much structure anywhere else in plots...it mostly just looks like messy noise. Fine. My EEG With My Eyes Open and Closed (No Meditating). The arrows point to alpha waves that are commonly seen when one's eyes are closed. Meditating: So, now we turn to the data from my meditating friend. The spectrograms below show data that we recorded from him using the same OpenBCI board and the same blue EEG cap. In these plots, my friend was already meditating by the time I started to record the data. So, to the left of the vertical line, this is data when his eyes were closed and he was meditating. To the right of the line, he was not meditating and his eyes were open and closed at various times. I find this data to be quite impressive. Notice that there is clearly a band of signal energy between 15-20 Hz while he is meditating. 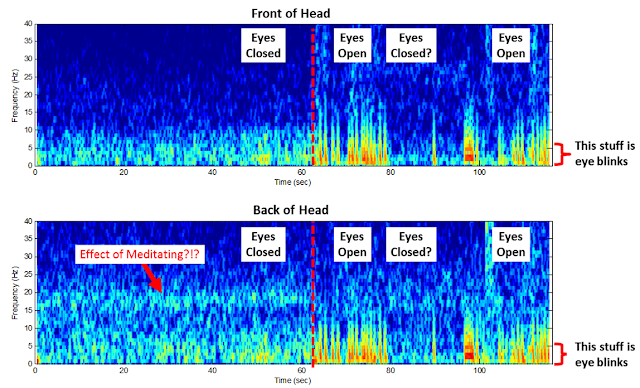 In the second half of the data, where his eyes are closed, there is maybe some of that 15-20 Hz signal, but it isn't nearly as strong as during the meditation. I think that it is very cool that we appear to be seeing a physical (well, electrical) effect in his brain due to meditation. Additionally, note also that he shows no alpha waves (nothing around 10 Hz) when his eyes are closed. Is the meditation suppressing his posterior dominant rhythm, or does he just not exhibit one? I don't know, but it's cool. EEG recorded from a meditator. Left of the line, he is meditating. Right of the line, he is not. Notice the signal energy between 15-20 Hz (and the absence of alpha waves) when he is meditating. What Does It All Mean? I make no claims regarding meditation being good or bad. I make no claims regarding EEG signal energy in the 15-20 Hz band being good or bad. All I know is that we can measure changes in his brain waves and that they appear to be due to him meditating. That's really cool to me. Have any of you recorded your brain waves while meditating? What did you find? Let me know! Follow-Up: I recorded another meditator. Check out his data here! Hello, i backep on the kickstarter project and can't wait to get my board! 2) you said the front part was Fp1 Fz wich is ok but the back T5-Fz ? or did you mean T5-Pz? 3) as for the band on 15-20Hz, it was really on the back of the head? do you know if the guy was on special medication cause such high frequency are often the result of it at least in the frontal area. Oh and byt the way good work! Thanks for the feedback. I fixed the broken link. Ooops! As for which electrode locations that I used...yes, Fz was the reference electrode for all my plots. I was wearing an EEG electrode cap and Fz was used as the common reference. Since it was simplest, all of my plots simply show the data as recorded. Therefore the back plots are T5-Fz. 3) yes, the 15-20Hz stuff was indeed spread throughout the back of the head. From that recording session, I've got plots from the other electrodes around the head. While the plots above are the best ones, the others still support the observation that the 15-20 Hz signal is more in the back than in the front. Perhaps there was some on the front of my head, too, and my use of Fz (which is near the front) as the reference made the 15-20Hz stuff less apparent than on the back, but the plots show what I have. Super cool stuff. I look forward to trying this out. Chip, great post and investigation. I had seen that paper before and it does correspond to my own experience with various meditation styles. Did you ask the subject what 'school' of meditation he was using? My guess is that it was one of the 'concentrative' or 'focused attention' styles, such as TM. Which are based on a mantra or particular visualization / imagination. This would align with what you are seeing in the beta band, since he is doing an active mental process. Although at very subtle and low levels, kind of an auto-pilot function in terms of network beta activation levels. But nowhere near the bursty activity level you would see on an intense cognitive task. The other comment is regarding your reference setup. Almost all multi-channel neurofeedback, and all normative database measurements --are taken with a "linked ears reference". In other words the two ear lobes are electrically connected, and this common signal becomes the reference electrode for all 10-20 positions. In cap situations, then the DRL / bias / 'ground' lead is connected to the cap at the non-10-20 position designed for that, just in front of Fz at AFz. This is actually best for the bias position because the anti-powerline signal injection there will tend to reach both sides of the head most evenly. The most popular style of Electro-caps used for this, do indeed have "ear-drop" leads that hang down from the cap in front of each ear. These are routed out to the 25 pin connector and usually connected together inside the amp, either programatically or with a jumper of some sort on a head-box. The name for this cap in the Electro-cap catalog is called the "Lexicor" style. One more Electro-cap tip: most users prefer the "surgical" style caps, because there is no need then for a chin strap. The surgical cap extends down a bit more, so doesnt need to be held in place. Linked ears are used because they give the most "uncorrelated" idea of the actual voltage at each 10-20 site. Using other 10-20 sites as a reference always means measuring the differential between those sites. So that your Fz reference was indeed picking up some signal from frontal and occipital (or T5 in your case) areas. Another researcher who has done a ton of meditation EEG studies is Richard Davidson, who has worked quite a bit with various Tibetans, including the Dalai Lama. and as Travis et al point out in that paper, the EEG signature of TM is alpha coherence in the frontal lobes. The fact that, even with the paper cited, you mis-identify TM, only emphasizes Maharishi's point that the more simple the practice, the more important it is to have highly trained teachers to impart that practice. People get so bound up in being certain that they already know everything that they simply repeat half-remembered mis-information, rather than doing fact-checking. Hey Lawson. Sorry, but I actually trained with the TM folks back in the early 1980's. Both their initial level program and the 'advanced' TM-Sidhi program. So I do know quite a bit about the meditation instructions used in TM. I left the TM fold a few years later and went on to study with various vipassana / mindfulness teachers, such as James Baraz, Jack Kornfield. I guess I would agree with you that TM is presented as "effortless". But nonetheless it has many aspects in common with approaches that are more active mentally, with some sort of mantra or visualization. I do not agree with your statement "TM isn't about focused attention, but letting your mind wander." Not true. Maybe that is how it was presented to a TV audience, but not what is given in instructions. I found your Youtube channel with the various segments showing EEG of TM meditators. Cool resource. I actually was following Keith Wallace's work in the 1980's regarding the coherence effects. Definitely impressed me. And... Other EEG researchers have also found alpha coherence / synchrony effects, most notably Les Fehmi's Open Focus practices and neurofeedback protocols. I have a fair degree of familiarity with Fehmi's work, having discovered it around the same timeframe as my TM involvement. I still do some Open Focus practice and use it with my clients. My understanding is that if TM researchers don't see any significant differences, they don't report them, at least in the text. if you look in the actual charts, you'll often see significance vs non-significance marked for various EEG frequencies. The before/after part starts 11:21 into the video. While in beginning TMers, broadband frontal EEG coherence isn't generally found during TM, enlightened TMers tend to show high levels outside of meditation, and the subject in the last part of the video shows it during TM as well. Note that, as far as I know, power in non-alpha is always low DURING TM, especially during the "pure consciousness" state. William, with regard to Les Fehmi's work, I couldn't find any papers discussing the degree to which the Open Focus training creates a situation similar to TM's. While it may be possible to get therapeutic effects from biofeedback by evoking alpha EEG coherence, that doesn't necessarily mean it is all the same as what goes on during or as a result-of TM. 90% of Congolese refugees showing high signs of PTSD became non-symptomatic by the 30-day post-test and remained that way at the 135-day post-test. In a second study, refugees showed similar results to the first study at the 30-day post-test, but 2/3 of the change in PCL-C scores occurred by the 10-day post-test. Subjects were refugees who fled INTO Uganda (one of the poorest countries in teh world), and conditions were pretty abysmal. The government of Uganda recently announced that they are now able to send police to patrol the refugee camps regularly (once per week) -a substantial improvement over the situation in the past. TM isn't a technique meant to evoke coherent alpha. That appears to be a consistent physiological correlate of whatever it is that goes on during TM. That you can evoke coherent alpha (to what degree isn't made clear that I can tell) and get a few of the TM benefits is interesting, and helps explain why some of the short-term effects of mindfulness practice don't "stick" after a few years followup (such as effects on hypertension). That said, I also can't find any research on "Open Focus" biofeedback training and hypertension. And of course, the concept of "enlightenment" likely never occurred to Dr Fehmi, either. Lawson, yes I actually watched the longer version of that video, which included the course description. Encouraging to see the TM organization now again picking up on the use of EEG as a means of communicating what is happening with TM. I'm also now giving more consideration in the appropriate 10-20 sites to both monitor and train for coherence. Fehmi uses Fz Cz Oz T3 T4. The TM research likes to employ F3 F4 P3 P4. I found the description of the sequencing also fascinating. They see that coherence first increases between F3 and F4, then P3 P4. Finally the sides ramp up at F3 P3 and F4 P4. Will definitely do some experimenting with this. With the OpenBCI 8 channel EEG, you could monitor all these at once, if you left out say Cz, which has less relevance if the TM sites are included. Thanks for that December 2013 Travis paper. Just saw your second reply regarding Open Focus, mindfulness practice, etc. Open Focus is more akin to various non-dual meditation practices, and is a form of attention training. I think we can both agree that the fields of consciousness research, "transformative technologies", etc. are blossoming right now. Each person has to find those tools that fit their unique "wiring". That so many research institutions are exploring these areas, bodes well for the future of mankind. RE EEG marketing: the eventual goal is to have a portable EEG machine in every TM center, so that live demos of TM's effects can be made. As well, reading between the lines, eventually you might see EEG used as a physiological tool for some kind of "advanced checking" via appropriately trained TM teachers. RE EEG coherence sequencing: I haven't seen the article yet, and I may be extrapolating in the wrong direction, but the way Alaric Arenander was describing things, it seems that the EEG can be used to identify an obvious progression for Maharishi's states of enlightenment: CC, GC, UC. With CC, growing alpha EEG coherence in the frontal lobes would correspond to growing sense-of-self. This appears most strongly in the Pure Consciousness state, and as alpha EEG coherence starts to appear more strongly *during* TM, a pure sense-of-self starts to emerge. When it appears outside of TM, strongly enough that that pure sense-of-self is noted at all times, even during deep sleep, one is said to be in CC. With GC, my speculation is that the EEG signature might correspond to the front-back alpha coherence: when that occurs, it would provide a stable background of self upon which to evaluate all sensory/thought/perceptual stuff. No research on correlates of GC as yet, but see below. With Unity, my speculation is that the growing coherence in non-alpha frequencies shown in that person who had been doing TM + TM-SIdhis for 8 hours a day for several years, might correspond to Maharishi's description of Unity -everything is perceived as fluctuations of Self. My understanding is that it is very common in anyone for higher frequencies of EEG to be harmonics of the fundamental alpha EEG frequency, so in the case of Unity, not only are they harmonics, but they are coherent harmonics as well. In a very literal sense, all mental/sensory processing really IS "fluctuations of Self" --that is, the processing is riding coherently as harmonics on top of the fundamental alpha frequency which, for someone in UC, is found throughout the entire brain. Note that Maharishi's claim that manifestation of the TM-SIdhis outside of practice is a test of Unity: if someone has sufficiently strong UC characteristics while engaged in normal physical and mental activity, they should be able to perform any and all siddhis whenever they want. RE research on post-CC enlightenment: Fred Travis tells me he's found new subjects reporting at least stable CC so he'll be doing a new study soon. He's been training with the folks at the Key Institute in Zurich, so EEG microstate research during Pure Consciousness, possibly in collaboration with the people who created the analysis technique, may be in the offing. Likewise, the Key Institute people are supposed to be doing their own research on TM which may be seeing publication later this year. EEG microstate research of CC may be possible as well, and the ultimate "proof" of the Maharishi Effect might conceivably fall out of that. Fred Travis' "field effect" EEG research was very crude, using 40 second epochs of EEG but EEG microstates research can divide things into much smaller time-slices, on the order of 10ms, which means 400x the data points available for analysis. If there's a EEG microstate signature associated with PC, and IF one can do data analysis of EEG microstates and detect an increase in the frequency of that microstate signature, it should be possible to establish genuine effects of group meditation in a laboratory setting. A lot of "if's" of course, but jaggedly bleeding edge research is always based on "if's." Lawson, thanks for these updates on the TM research. You might enjoy this paper by Jeffery Martin on his categorization of non-dual consciousness states. Which he calls PNSE, Persistent Non-Symbolic Experiences. His website is the nonsymbolic.org listed there. As Martin points out, the various "locations" on his continuum are not hierarchical or ordered in the sense that later locations are "better" than earlier ones. In fact Location 4 is by far the least common state that has been reported. And as you can see from his description, not a state that most normal humans would desire to occupy. If you read the descriptions of Locations 3, 2, 1 -- you'll see terms more familiar to the TM states you mention. William, no EEG analysis was done, which is very unfortunate. As well, I yet to hear a description of any TM-related higher state that talks about complete loss of emotion, even in Unity. I don't know that there was a cessation of thinking or decrease in thoughts concerning "self" in any of teh CC subjects in Fred's study, but their description of self was different than anyone else's, for sure. While some of these people may have been spontaneously in CC or higher states as defined by TM, the fact that "stress" was involved in some of them suggests that an entirely different thing was going on. As well, teh physiological correlates of long-term TM practice are radically different than the physiological correlates of long-term mindfulness or concentrative practices, so anyone who had attained a "higher" state via those practices would certainly be showing different physiological correlates AND likely different mental landscapes as well. TM enhances "sense of self" while mindfulness reduces it. All "higher" states in Maharishi's theory depend on the emergence of a stable sense of self, while any kind of stable "higher state" or states that occur due to mindfulness would certainly involve reduced sense of self. The fact that some of the descriptions overlap may be due to some common physiological functions or it may simply be due to limitations of language. Apologies if my last post seemed overly pedantic regarding the reference stuff. It's just drilled into us as neurofeedback practitioners consistently. I _have_ seen BCI demos where they use just a single ear lobe, but linked ears is more balanced if you have the time. Here is a link to a nice video demo on Jove of BCI2000: http://ecsource.jove.com/CDNSource/1319_Williams_EEG_062609BLING_F.flv?ec_seek=0 and the accompanying transcript, http://www.ncbi.nlm.nih.gov/pmc/articles/PMC2900251/ . I do understand that at your live demos with the OpenBCI and a cap, you just want something simple and fast to setup. So Fz reference made sense for that. And... with the ear reference you _would_ see the eye blink artifacts disappear at O1, as you would expect. Regarding the choice of reference electrode, I am aware that there is a plurality of practice out there...not just linked ears, but many other choices as well. I am aware that linked ears is certainly quite common (the most common? )...though I know that the linked-ears approach is criticized by some people because, by having a wire attached to both ears, you are electrically linking together parts of the body that were are not normally linked together. Some people are concerned that this external connection between the ears changes the way that electrical potential is distributed through the head. From a theoretical standpoint, this seems like a fair criticism. I am also aware of the common practice used by clinicians, which is to use the computer to re-express the data as if it were using a different reference electrode than was actually used. When letting the math do the work, they can then plot the EEG data using a "reference" that can't actually be phyisclally recorded. One example is to plot each EEG channel relative to the global mean of all the EEG channels. That sounds pretty sensible. Another option is to re-plot each electrode relative to its local mean (ie, plot each electrode relative to the mean value of just the electrodes surrounding the electrode of interest). That sounds like a good idea, too. So, while I completely concur that the choice of reference has a *huge* effect on how the results appear, I also recognize that, through the power of computing, we can easily re-plot the data using any of my electrodes as if it were the reference. The computer allows us to separate the choice of which reference is used for *recording* versus which reference is used for *plotting*. I like that freedom. Chip, thanks. Yes alternate 'montages' (sensor referencing) are used. Good point. In the neurofeedback community we all use the ear reference. Either a single ear clip for one channel work, or both ears linked for 2 or more channels. Here's a link to a photo of a nifty plastic ear clip, in which you can snap a cup electrode. Making a very inexpensive and comfortable ear reference connection. William, than ks for the reference to the PSNE study. "As the overall picture was examined what emerged was a continuum that seemed to progress from ‘normal’ waking consciousness toward a distant location where participants reported no individualized sense of self, no self-related thoughts, no emotion, and no apparent sense of agency or ability to make a choice. " no emotion? People in CC have plenty of emotions -they just aren't identified as being "self." William another striking difference between the PNSE that leaps out is the reporting that this state is associated with greater stress in some people. Also, the disconnect between how aware they claim they are of the body vs how aware they really seem to be seems rather the opposite of the correlation with Norwegian athletes, where the world champions showed higher CC-like EEG and self-descriptions than the non-world-champions. Common sense would suggest that world champion athletes have REALLY strong and accurate "body sense." Thank you for this. My OpenBCI arrived yesterday so I have a great weekend ahead getting set up. I have been meditating for several years (on and off) and know people who have been meditating consistently for decades. This is something I am hoping to explore with my kit which I'll be blogging. I'll be happy to keep you posted as I go along. thank you for this sharing, I have a question, you plotted Spectrogram in Matlab, right? I tried but I failed, I don't know why. Could you send me the code for plotting Spectrogram in Matlab? I really appreciate it.